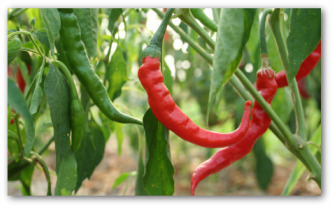 Easy tips for growing cayenne peppers in the vegetable garden. How to plant, care for, harvest and store cayenne and other pepper plant varieties. Well-drained soil, without too much nitrogen is needed for growing peppers. An overabundance of nitrogen makes the plant's foliage grow so lush, in fact, the plant forgets all about making peppers. Varieties of the hot peppers include: Long Red Cayenne and everyone's favorite, Tabasco. • On the hardiness scale, peppers are very tender. 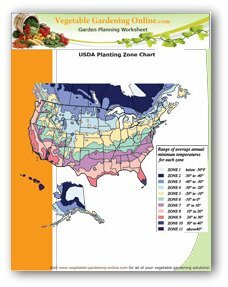 • The plants require a soil pH of 6.5. • Plant in cold frame or indoors in flats 5-8 weeks before last expected frost. • The distance between plants should be 2 feet. • Leave a space of 3 feet apart between rows. • The peppers reach maturity in 115 days. Give your peppers a head start by planting seeds indoors 5 to 8 weeks before the frost-free date for your area. For plants that require more than 90 days to bear fruit; starting early is necessary (especially for gardeners in the northern section of the country) to have enough time to produce a sufficient harvest. Keep the leaves of the growing cayenne peppers clean and not covered in soil as they often become when being transplanted. The immature plants need to absorb as much light as possible through its foliage in order to grow. Plant the pepper seeds in peat pots or short wooden flats, which are excellent for transferring outside for row planting. A cold frame can be used to house the flats outdoors to save you from lugging them around. The principle of the cold frame is that it blocks off chilling winds while permitting the radiant heat of the sun to shine through. Avoid setting the hot pepper plants out too early; while night temperatures are still dropping below 60 degrees F. Curiously, the tropical native plants are also adversely affected by stretches of extremely hot days, above 85 degrees F.
Caution: Label Your Hot Pepper Plants! A plant or two of a favorite hot pepper can be grown in a spot away from sweet peppers. Bear in mind that hot peppers can look much like their sweeter cousins and they too begin as green or yellow fruits before they ripen to red. Children and visitors who do not know their way around a vegetable patch should be instructed which peppers are "hot". Label the stakes "fiery" to better keep track of the growing cayenne peppers. Harvest growing cayenne peppers by cutting the stem one inch above the pepper. Avoid twisting loose when harvesting the produce. Hot varieties such as Tabasco and cayenne must be picked red. Hot peppers can be harvested as needed, although, they are at their hottest when fully ripened. 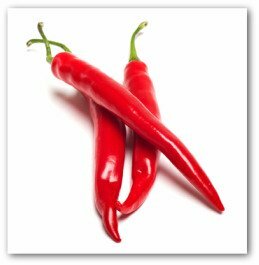 The hot red pepper makes a very hot-tasting red powder that is made from the dried and ground seeds and fruit of several types of chili peppers. Use in cooking and as a stomach astringent. The fruits can be dried as a spice or pickled in wine or vinegar. To destroy uninvited insects in the cold frame or greenhouse, smash up some laurel leaves in a bowl and leave overnight. The damaged laurel releases prussic acid gas, which is deadly to the eggs of most bugs. Small amounts of the acid do not harm humans. Many seasoned gardeners suggest toughening up young seedlings in the greenhouse by running your hands over them as often as a dozen times a day. Seedlings raised in an enclosed glasshouse can be shattered when left out in the open. This old trick is a way of preparing the plants for the outdoors.